This weekend we had two doggie events, but unfortunately Brody was not at his best! Since nationals (still waiting for photos and videos to post from the Paws N Music at Nationals!) he hasn't been eating properly, and the Friday night he threw up, poor boy! On Saturday we were part of the Paws N Music demonstration at the Wag N Walk. The Wag N Walk is a big doggie festive in the Milford Reserve, North Shore. 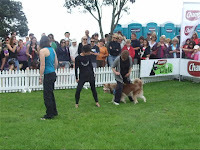 Its a fun walk, lots of demonstrations, competitions, and stalls with pet products. IT was also fundraising for the SPCA, and Paw Justice. From Choredography we had Suzanne with Finnegan, Suzanna with Monty, Hsin - Yi with Honey, Michelle with Moss, me and Brody, with Jan on the microphone. See Honeys blog for Hsin-Yi's take on the event! Brody was great despite obviously feeling not too great, he just wasnt quite his ADHD self. His routine was great, he hit everything except his weave was a bit wonky, but thats ok! We get a great cheer from the crowd, and lots of 'Ooooohhhsss'. Then on Sunday we had the Counties agility championship show. Brody was very tired, but managed to get two clear rounds (Starters and Jumpers C), but was a bit slow as he was tired, so missed out on placing.